In this article I will discuss Fuse Operation and Principle. A fuse is a simple electrical part which consists of a wire and terminals on each end. It is plainly a passive device which protects the circuit in the event of a large current. When this happens, the fuse element will open and the circuit will become discontinuous. Fuse operation and principle is straight forward unlike other active electronic devices that requires deep understanding. A complete discussion on fuse operation and principle is discussed thoroughly below; so continue on reading. Let us also make familiar with the two general classifications of fuse to better understand fuse operation and principle. These are time lagging and fast acting. A time lagging fuse has a significant delay before the fuse element melts or open up from the application of high current. This type is very popular in capacitive circuits such as in switching converter and power supply. A fast acting however, will open up immediately when there is huge current flowing. This is very useful in critical designs wherein a very fast protection is desired. Figure 1 – Some fuse types used in the industry nowadays. 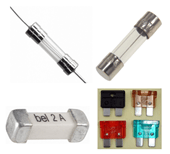 Different industries and applications require different type of fuse. Fuse is a fundamental component used to protect electronic and electrical circuits from excessive current or short circuit condition. Install the fuse in series to the circuit that you want to protect such as in Figure 2a. If the subject circuit has several branches (different current paths), be sure to connect the fuse in the section where the sum of all the currents is flowing as depicted by Figure 2b. Fuse must protect the circuit under abnormal condition by quickly opening the circuit. This is the ultimate purpose of the fuse that should not be defeated, thus it is very important to select a correct fuse rating. Figure 2 – a) Fuse location with circuit that has one current path. b) Location of the fuse for several current paths. A fuse is can be inserted to any branch in Figure 2b as well for the reason to protect the devices on the specific branches. With the location of the fuse depicted in Figure 2b, the circuit total current is surely covered. In the event of short circuit or abnormal increase in circuit current, the fuse will quickly open and the large current cannot flow anymore to the circuit. When a fuse blows, do not replace the fuse with another rating or value instead maintains the rating as this is practically designed for the circuit. Replacing the fuse rating to a higher one will put the circuit in danger since it will not blow on a specified current and time. On the other hand, if a fuse rating has been replaced by a smaller one, the circuit will keep on opening even the current is not yet reaching the specified trip level. You can also install fuse to any branch in Figure 2b as needed. Be sure to realize the purpose of the fuse. There are some important parameters to consider in selecting a fuse. These are the Current Rating, Ampere Square Seconds, Breaking Capacity and Voltage Rating. More information on these parameters will be discussed below, just keep reading. A useful design practice in selecting a fuse which is also recommended by fuse suppliers is to consider the 75% factor. A 75% factor means that the continuous circuit current should only be 75% of the fuse continuous current rating. The purpose of this is to compensate the environment temperature effect since at high ambient temperature a fuse breaking point will decrease. For instance, a 10 ampere total circuit current should use a 13 amperes fuse. However, the designer should ensure that the circuit can withstand the 13 amperes of current in a short duration until the fuse open up. A circuit has a nominal current of 10A. What should be the typical current rating of a fuse to be used? In adopting this technique, be sure to ensure that the circuit components are able to withstand the excess current before the fuse act its role. In other words, the components in series with the fuse should have a current rating higher than the melting point of the fuse. With this, every time there is sudden increase of current, only the fuse will blow. A particular fuse has an I2t of 100A2seconds. What should be the maximum allowable inrush current of the circuit if the permitted transient period is 1 second? The current carrying capacity of a fuse will be greatly affected by the operating temperature. Once the operating temperature is high, the current capability will decrease and the fuse will melt earlier as it is designed at typical or nominal conditions. Fuse manufacturers provided a graph in their datasheets which containing the current versus operating temperature. To site an example, see below. 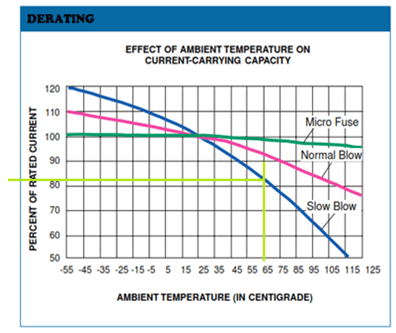 Figure 3 – This is an example of a current carrying capacity of a fuse versus the ambient temperature. The higher the temperature is, the lower the current capacity of the fuse. Figure 3 is taken from the datasheet of a certain fuse manufacturer. As you can see at 25ºC ambient temperature the current carrying capacity of a three types of fuse is at 100%. However beyond this temperature the current carrying capacity started to decrease. For instance, a slow blow fuse current carrying capacity will decrease to around 82% at 65ºC ambient temperature. Fuses nowadays come in several packages so select the most appropriate for your design. Fuses are also characterized as fast blow or slow blow one. Fast blow is fast acting type wherein the I2t rating is small. This is suitable for sensitive and or critical circuits. On the other hand, a slow blow fuse is a time lagging type wherein the I2t rating is relatively higher than fast blow. This is popular in applications which have large capacitors such as switching mode power supply. The key to properly select a fuse is through understanding the Fuse Operation and Principle. Fuse is a simple component but most of the times is being under designed that causes some issues. You may read the article How to Select a Fuse as compliment for this.